The GSI Audera™ provides AEP and ASSR testing in a modular system for the busy audiology and ENT practice. Audera excels in generating high quality data, providing simple system operation, and utilizing convenient database management. Test results are easily interpreted through comparison to normative data sets. GSI Audera is proud to feature the CE-Chirp® and CE-Chirp Octave Band stimuli. Wave V generated by a CE-Chirp has been demonstrated to be 1.5 to 2 times larger in amplitude than Wave V generated by a Click. This results in reduced test time, less need for sedation, and increased test confidence. Reduce training time and increase comfort level using the same operation for both modalities - AEP and ASSR. Have a consistent user interface, short cut keys and automated test sequencing. Protect your data with a robust and flexible SQL database to archive, backup and review all patient data. Choose from the standard clinical protocols or customize your own with the easy to use protocol wizard. Create a consistent testing regime for all patients or research protocols insuring a standardized methodology is used with automatic testing protocols. Enhance clinical confidence of data interpretation when comparing results to published norms, or set your own normative data for research. Check electrode impedance on the amplifier beside the patient instead of having to go back and forth to the computer. Scroll through the various evoked potential exams without having to go to the main screen and recall another exam. Save time and increase clinical confidence using CE-Chirp, CE-Chirp Octave Band stimuli with up to 2 times greater ABR amplitudes. Save valuable time by using standard protocols or establish your own. Continuous live display of waveform and EEG. Normative data is provided for all test stimuli including CE-Chirp for adults and infants. Easily establish and enter clinic normative data and waveform markers. Reduce training time and increase comfort level using the same software application for both test types. 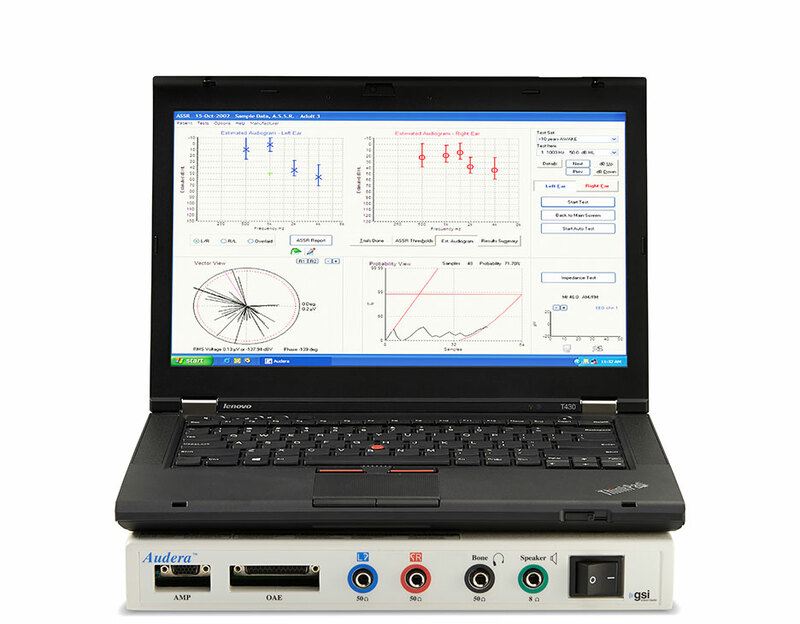 Ideal test stimuli for collecting robust waveforms in the fastest amount of time. Save time and make changes by checking electrode impedance at the patient's side.